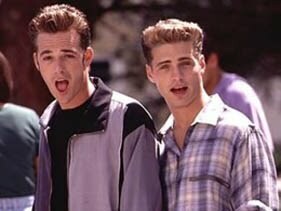 JASON PRIESTLEY AND LUKE PERRY JOIN UP FOR A WESTERN…I Guess the 90210 Royalties Finally Ran Out. Look, in the 90s I would videotape Beverly Hills 90210 because I had a huge crush on Brandon and I loved to mock David and his rap career, so I’m not even going to apologize for covering this Hallmark Channel movie in which Dylan stars as a man who is (and I’m quoting the tag line here): Good Man. Warm Heart. Sweet Justice. How can your horrible heart not want to immediately set the Tivo this Saturday (Jan. 29th) at 8:00pm Eastern after reading that? You know it’s going to be the worse thing imaginable and the only thing better than making fun of it is inviting over all your 30-something friends and getting royally tanked on Mad Dog 20/20 and Doritos. I know, who knew you guys would make a crappy western? John Goodnight has a crystal clear memory of the day that his family fell victim to ruthless outlaws. He and the wife of Circuit Judge Aldous Shaw were the only survivors of the attack; she would become his foster mother. Goodnight cannot forget the corrupt man who destroyed his family and he lives for a second chance encounter with the outlaw. After Goodnight has a rocky start as a solicitor, the Governor swears him in as the Western Territories next Circuit Judge. Goodnight travels the West seeking protection for the innocent, until one fateful day, when his journey takes him to a place that is all too familiar. And it’s directed by Jason Priestley. So there you have it people, a gift handed down to you by the Nostalgia Gods. I don’t know what you had planned, but nothing is gonna be so awfully-good as this.